SUBHEAD: Millions of bees mysteriously disappeared, leaving farms with fewer pollinators for crops. Image above: United State Geological Survey map of the continental states showing extent and intensity of the use of glyphsoates applied to cropland in 2012. Click to enlarge. 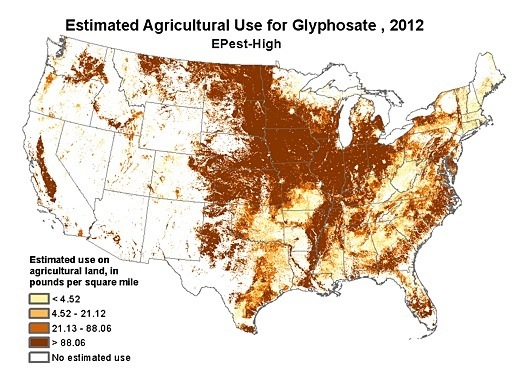 From (https://water.usgs.gov/nawqa/pnsp/usage/maps/show_map.php?year=2012&map=GLYPHOSATE&hilo=L). Glyphosate, the world's most common weed killer, has caused significant concerns over its potential risk to human health, animals, and the environment for several decades. Earlier this month, a US court awarded a groundskeeper $289 million who claimed Bayer AG unit Monsanto's glyphosate-based weed-killers, including Roundup, gave him terminal cancer. Now, a new report from PNAS alleges that glyphosate may be indirectly killing honey bees around the world, a threat that could potentially also leave a major mark on the global economy. “We need better guidelines for glyphosate use, especially regarding bee exposure, because right now the guidelines assume bees are not harmed by the herbicide. Our study shows that’s not true.” said Erick Motta, the graduate student who led the research, along with professor Nancy Moran. UT News of The University of Texas at Austin says that glyphosate interferes with an important enzyme found in plants and microorganisms, but not in animals, it has long been assumed to be nontoxic to animals, including humans and bees. However, the latest study reveals that by altering a bee’s gut microbiome — the ecosystem of bacteria living in the bee’s digestive tract, including those that protect it from harmful bacteria — glyphosate jeopardizes its ability to fight infection. For this study, scientists exposed honeybees to glyphosate at normal levels found on farms. The researchers painted the bees' backs with colored dots so they could be tracked and later recaptured. Three days later, they saw that the honeybees exposed to glyphosate suffered a significant loss of bacteria in their guts and were more susceptible to infection and death from harmful bacteria. In recent times, US beekeepers have reported a massive loss of bees or Colony Collapse Disorder (CCD). Millions of bees mysteriously disappeared, leaving farms with fewer pollinators for crops. Officials have been baffled, and the media has been quiet about the bee population collapse. Explanations for the phenomenon have included exposure to pesticides or antibiotics, habitat loss, and bacterial infections. The latest study now adds herbicides to the list as a possible contributing factor. Among the nuts, almond growers have the largest need for bee pollination. Bee pollination is worth $15 billion to the US farming industry. Any sharp change in global bee populations could affect the beef and dairy industries. Bees pollinate clover, hay, and other forage crops. As the bee population dwindles, it increases the cost of feedstock. That forces inflation into beef and milk prices at the grocery store and ultimately hurts the American consumer. This could then lead to increased imports of produce from foreign countries where bee populations are healthy, further widening the trade deficit. Couple this with the current trade war and this particular "black swan" - or rather "black bee" - problem, may be just the tipping point that finally forces the US economy to catch down to the rest of the world. Image above: United State Geological Survey map of the continental states showing extent and intensity of the use of glyphsoates applied to cropland in 1992, twenty years earlier than map above. Note that at that time the Central Valley in California was the densest and most intense use of glyphosates on food crops. 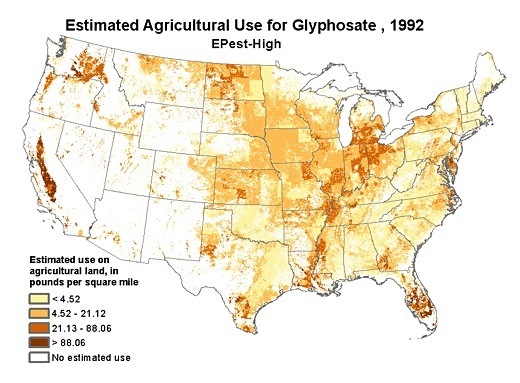 From (https://water.usgs.gov/nawqa/pnsp/usage/maps/show_map.php?year=1992&hilo=H&map=GLYPHOSATE).